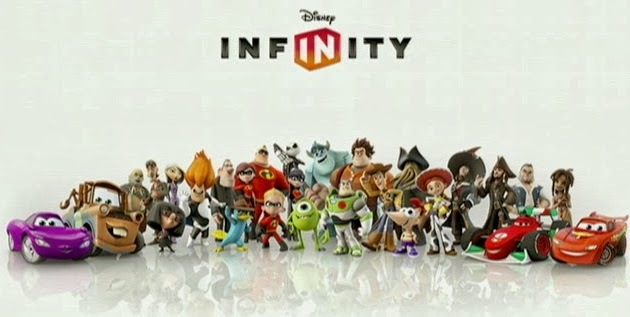 Disney Infinity is here, but how does it compare to Skylanders? A while back I mentioned how much the kiddos love Skylanders. The boychild got the latest Skylanders SwapForce for his birthday and the whole family enjoys playing it. We tried out Disney Infinity while staying with relatives over the Thanksgiving holiday. So which one wins? With things as they stand today, the answer for us is Skylanders. Note: I am not a big gamer, but I have spent a lot of time playing the games with the kids. Played both games on Wii. Simple, fairly linear gameplay with some side tasks and challenges. Lots of fighting, some search and find, fantastic visuals, with animated sequences in between to propel the main storyline along. The controls are really intuitive. The boychild is just learning how to read and he rarely needs our help to figure things out. This is our second Skylanders gaming experience and it's not hard to see why this is the best-selling game franchise. The characters are fun. All manner of beasties with all kinds of fighting styles. This is where the real appeal is, collecting all of the fun characters. A select group are able to swap the upper and lower halves to create new character. Some challenges require this. For these characters you can earn new powers for the top and bottom halves, which then can be used in any new being you create. This is probably the kids' favorite part of the game. I can't say that there is a 50/50 split among gender for the characters, but there are some kickass female characters. Hex is my spirit animal. 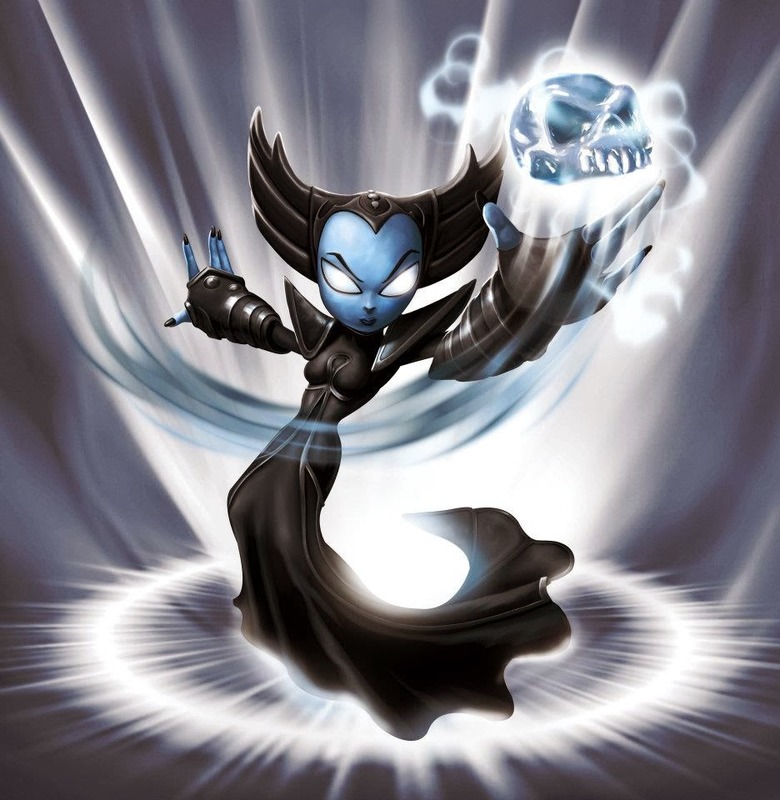 Her opening line is "Fear the dark" and when she gains more strength she croons "More power, I love it". I dig her. A lot. I want to get Roller Brawl too. She looks very cool. Girlchild is on board. 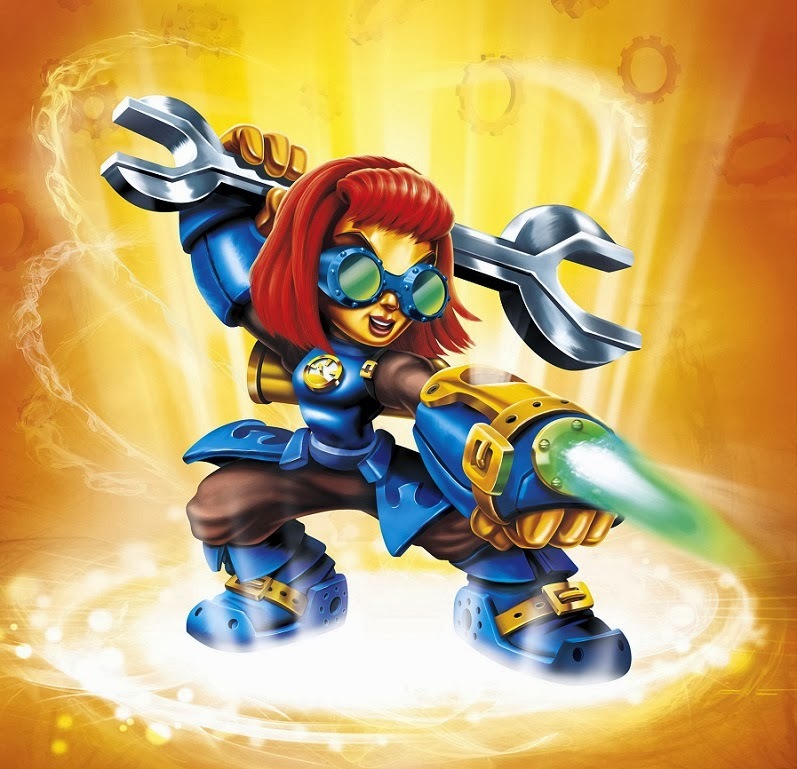 We already have Sprocket who creates her own weapons of destruction to take down foes. And they're all reasonably dressed. You will likely finish this game quickly, although I do think it is more challenging than Giants. See, what good are all of these fantastic fantasy worlds if you waste space on ones like Lone Ranger. Yes, out of all of the Disney properties, they chose to have a Lone Ranger world. What. The. Hell. There are two main playing options. You have the individual character worlds, where only characters from those worlds can play, then you have the Toy Box where you can build and develop your own adventure and honestly I haven't spent enough time with it to really give a thorough review. I was that bored. And so was the kid. It felt like the creators said, "Oooh, Skylanders is popular, so let's have characters, and look over here, all the kids are into Minecraft, so lets have some building levels too." Wrap it up with clunky, non-intuitive controls and what could have been a load of fun became a quick lesson in frustration. We never got out of the teaching moments of the game. I wonder if in the final battle it would still be trying to get you to learn something new about the controls. It says on the box 10+, and you do need to be able to have strong reading skills to do this game. And that's fine, I guess. 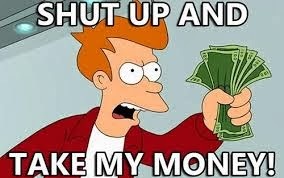 However, the boychild picked up Minecraft within 10 minutes and it didn't cost $75. Also, by the time he is 10, he will want a stronger game than this. Note: I'm focusing on the boychild more in this review because Infinity did exactly zero for the girlchild. The worlds were a bit more our speed. You have set challenges and the game tries to help you complete them. And help you, and add more suggestions, and god help you if you don't follow the suggestion because then you might have to start the level over again. Once or twice or (cough) ten times. The starter pack comes with The Incredibles, Monster University and Pirates of the Caribbean worlds and figures. Of the three, The Incredibles was the most fun. Pirates was all right, but honestly, we've been playing LEGO Pirates of the Caribbean and that one is just better. There were also no female characters in the starter pack. There are extra characters you can buy who don't have their own worlds, but can be used in the Toy Box and have a unique challenge. One of these is Jack Skellington. 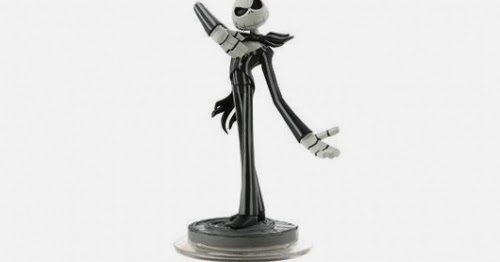 The most obvious sign for me that Infinity missed the mark with it's world choice was when the boychild excitedly put Jack on the portal, visions of Halloweentown dancing in his head, only to have the crushing disappointment that there was no Nightmare Before Christmas world. He put Jack away and went back to The Incredibles. There are 20 years of fans of Tim Burton's phenomenal movie. My kids grew up watching it. They would play the hell out of a game with Oogie Boogie and Santa, but no, it is not to be right now. What about Neverland? Sure, Peter Pan is an older flick, but we've all seen it and with the kiddos watching the Disney Fairy movies and Jake & the Neverland Pirates, there is a whole generation waiting to go flying over Captain Hook's ship. Or what about a Disney Princess world? Think of it: being able to team up Mulan and Merida to take on Maleficent. But no. They just want to invest in worlds of recent movies. Except for The Incredibles. Whoever pushed that one through was genius because it was all that saved Infinity for me and gave me hope that they could do better in the future. So, will I be adding Infinity to our home game system? Not until they come up with better worlds. How about you? Has anyone had a better experience with Infinity? My 7 yr old is gagging for Infinity for Xmas, the 11 yr old wants SwapForce. I'm torn, Skylanders annoys me in that every time they bring out something new, it requires a brand new portal. It does feel like they treat parents as cash cows. I'm still on the fence about which way to go. At least you can use all of the old Skylanders characters still. :) Although I think (hope) that the Infinity portal will stay the same. Who knows. You will not feel less like a cash cow with Infinity, I'm afraid. Especially not if they finally get some more decent worlds.